A few weeks back I got an invite to attend an event at the Rosebank Fire Station where Hannelie Coetzee would be putting the finishing touches onto a sculpture entitled ‘Samantha’. The FireStation is the second oldest building in Rosebank after the Old Post Office, now the Monarch Hotel on Oxford Rd. 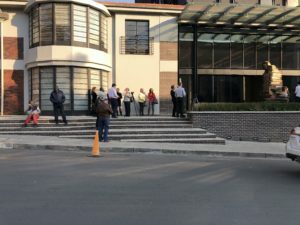 Dating to 1935 the Rosebank Fire Station is a heritage building and so any alterations had to be done in line with the requirements of the heritage act. 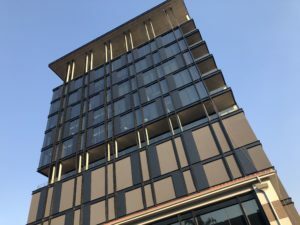 This latest development has been undertaken by Justus van der Hoven Snr, owner of ARC Properties, in a joint venture with established commercial, industrial and residential developers Tricolour Investments. The new development comprises seven storeys of sectional title offices with a roof terrace. The old Fire Station is still in situ facing onto Bath Avenue and glass frontage to the office building offers views through into the Fire Station. The design and conservation ethic has been to celebrate the old building rather than imitate its historical features. Quite how it does this is not entirely clear. Watch this space for more on Rosebank development. Stay at our well located Guest House and visit the Rosebank Fire Station. View our Rosebank Guest House for Rates and Availability! Hannelie Coetzee is one of my favourite Jozi based artists. She works a lot with concepts of sustainability and the need for conserving our natural resources. See previous blog. So when I received the invite I made sure that I diarized the time and date. I had seen Samantha at the 2016 Joburg Art Fair at the Sandton Convention Centre and loved it. The way Coetzee uses large blocks of material that work like pixels only coming into clear focus from a particular distance is always intriguing. Also her use of recycled material is in keeping with her philosophy of sustainability. 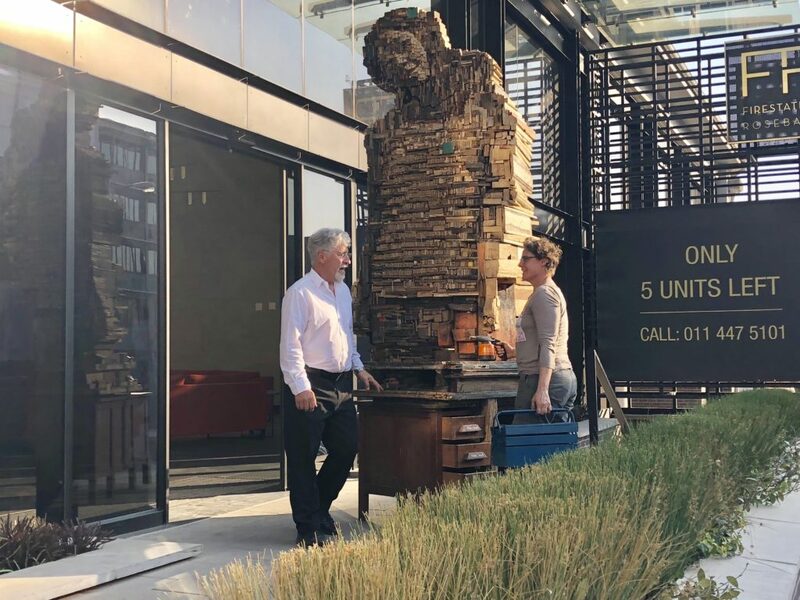 Samantha (who is based on a woman who lives by one of Jozi’s spruits), is made of reclaimed wood and found objects including cleaned and fumigated re-used parquet flooring and wood from demolished buildings such as the Rissik Street Post Office. The work is large scale: 3.2 x 1.40 x 1 m. Here, as Hannelie fills in some of the last remaining giant ‘pixels’ at the back of Samantha, you can see her ‘insides’ and how she is constructed . ‘Samantha’ now stands in the foyer of the office building called the Rosebank Fire Station and all are welcome to go and take a look. Go check her out. You can see Hannelie’s work in other public places. 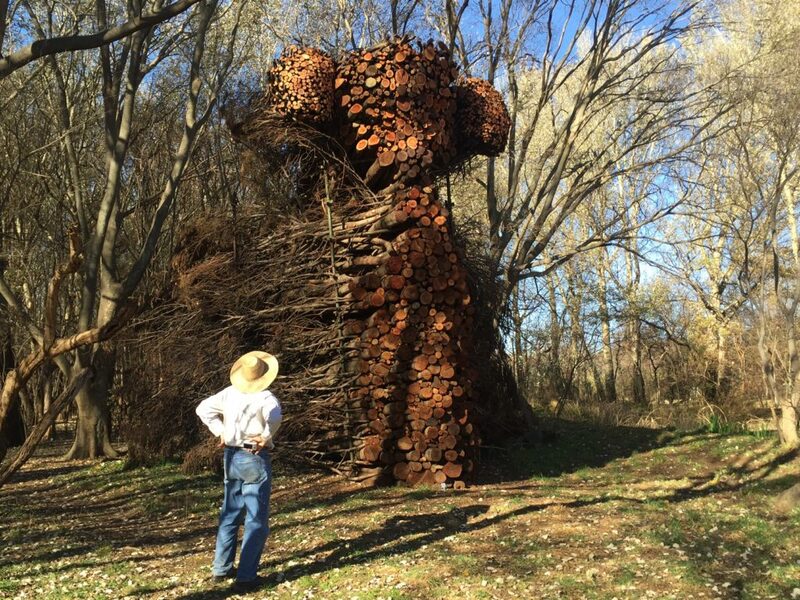 Her Glistening Demoiselle made out of black wattle is on permanent exhibition at Nirox Sculpture Park in the Cradle. 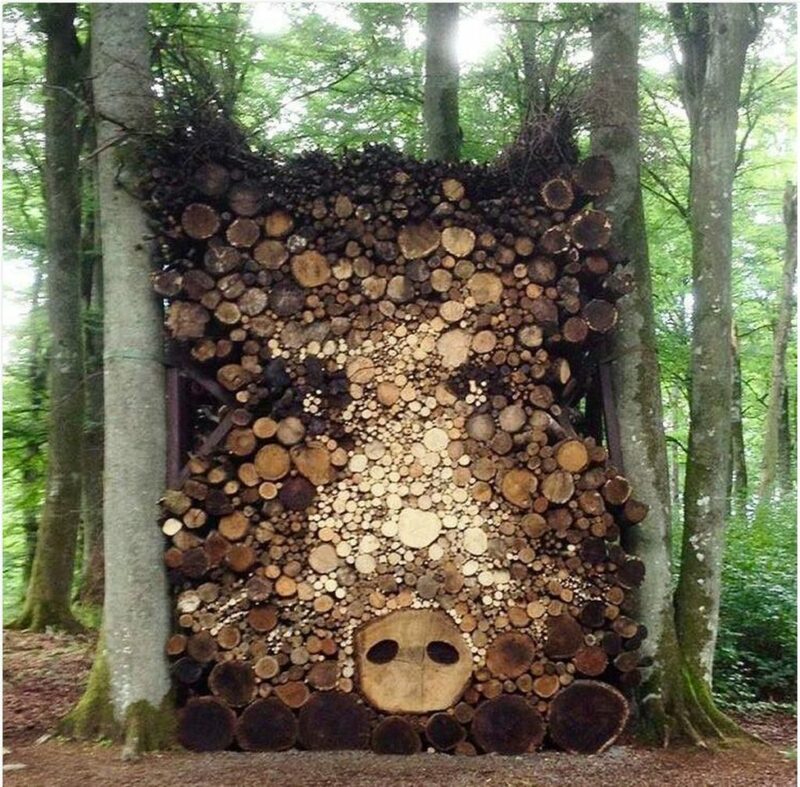 And how’s the pig below in a Swedish sculpture garden? 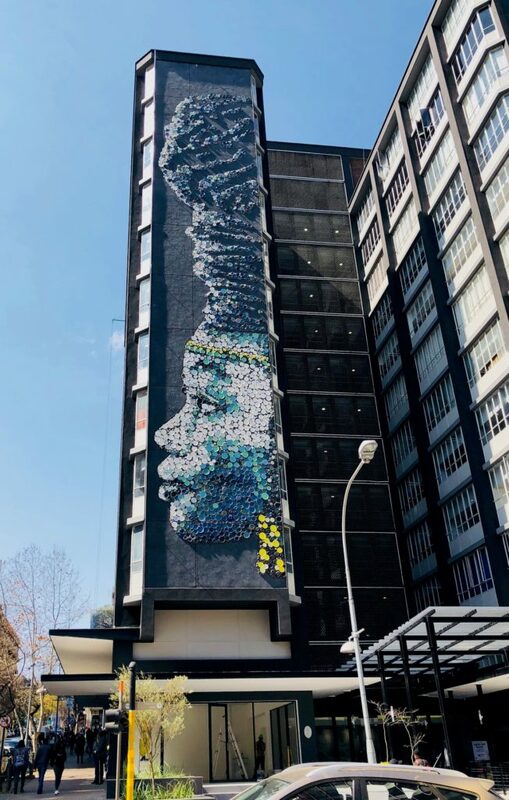 And on Women’s Day 2018 Hannelie unveiled her 10 storey 166m² portrait entitled Ndundza/Nzunza on the west facing facade of North City no 28, Jorrissen St Braamfontein (cnr Melle St). North City has now changed its name to Nzunza. (The Ndzundza/Nzunza Ndebele lived in the Highveld from the 1630s until the late 1600s). Coetzee used more than 2000 reject pottery plates from Liebermann’s Pottery and 2.6 tons of adhesive to make this mural. 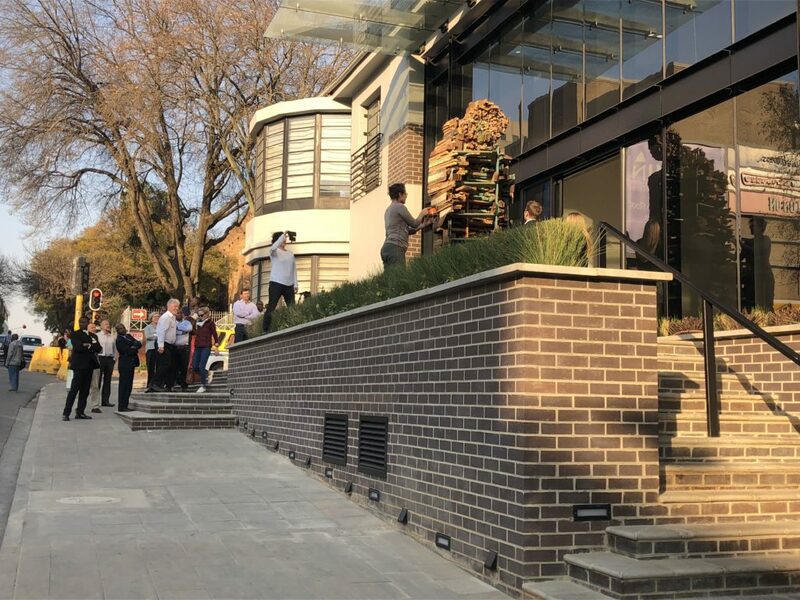 It’s really impressive and you can see it on the right driving east on Jorrisen St.
Two unveilings of a Hannelie Coetzee public sculpture in 2 weeks – well done Jozi and well done Hannelie!